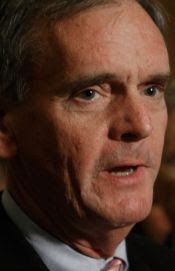 Looks like Republican Sen. Judd Gregg of New Hampshire (the We Vote First So You Have to Pretend We're Important State) is President Obama's pick for Commerce Secretary, that thankless job that Bill Richardson scandaled his way out of. Gregg also fought President Bill Clinton’s efforts to increase funding for the Commerce Department to administer the 2000 census. Indeed, Gregg’s commitment to basic functions of the department has been questioned at times. "He was generally pretty harsh on them and not really interested in their programs, especially the commerce side of things," said a Democratic appropriations aide. Um, maybe he left that part off his resume? [E]ven some Republicans are surprised by Gregg’s apparent enthusiasm for the job. "I guess if you can’t destroy it, go be in charge of it," said a Senate Republican aide. Which, incidentally, was Barack Obama's rationale for forging his birth certificate and covering up his secret Muslim terrorist roots in order to run for president of the United States. So they do have that in common.